Adult fruit fly Ceratitis fasciventris are 4.5-6 mm long, brightly coloured, usually in brown-yellow patterns. The wings are spotted or banded with yellow and brown margins. Mango Fruit fly (Ceratitis cosyra)The body and wing color is yellowish, with black spots. 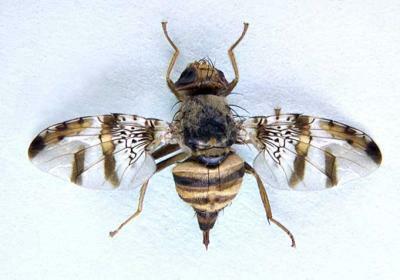 Adult mediterrenean fruit flies are 4-6 mm long,The wings are spotted or banded with yellow and brown margins. Mediterranean fruit fly (Ceratitis capitata). Adult mediterrenean fruit flies are 4-7 mm long, brightly coloured, usually in brown-yellow patterns. The wings are spotted or banded with yellow and brown margins. The trap can be made with plastic bottle with 4 holes evenly spaced on its sides (so that fruit flies are trapped), a lid, a wire hanger. The trap is filled with bait (vinegar and soap or peace of banana) and hanged on the tree about 2-4 m above the ground within the canopy layer, in a semi-shaded spots, preferably in the upwind part of the canopy. The trap should be hanged in such a manner that branches and leaves are nearby, but not touching the trap. Traps should be hanged 10 - 50 m apart, depending on the bait used. Collect catches weekly and sieve them. 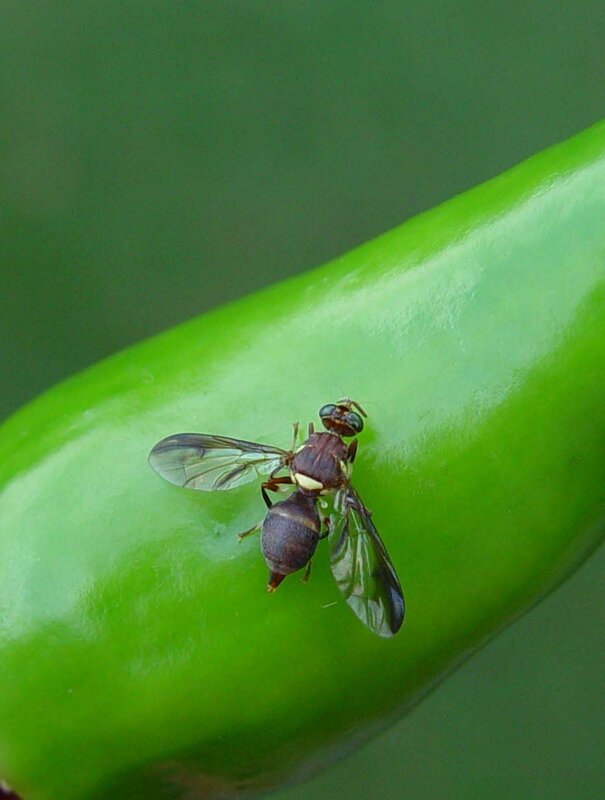 Fruit fly (Daccus bivittatus) on a chilli pod. Natal fruit fly (Ceratitis rosa), wing length 4-6 mm. Ceratitis spp., Dacus spp., Bactrocera spp. Fruit flies (diverse species) have been recorded in all African countries. 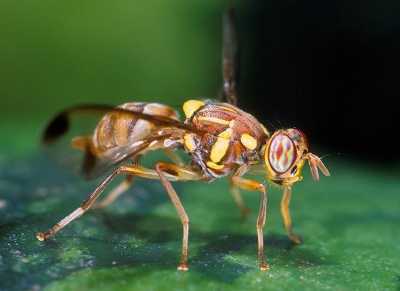 The Mediterranean fruit fly is the most widely distributed. Fruit flies cause direct damage by puncturing the fruit skin to lay eggs. During egg laying bacteria from the intestinal flora of the fly are introduced into the fruit. These bacteria cause rotting of the tissues surrounding the egg. When the eggs hatch, the maggots feed on the fruit flesh making galleries. These provide entry for pathogens and increase the fruit decay, making fruits unsuitable for human consumption. Generally the fruit falls to the ground as, or just before the maggots pupate. 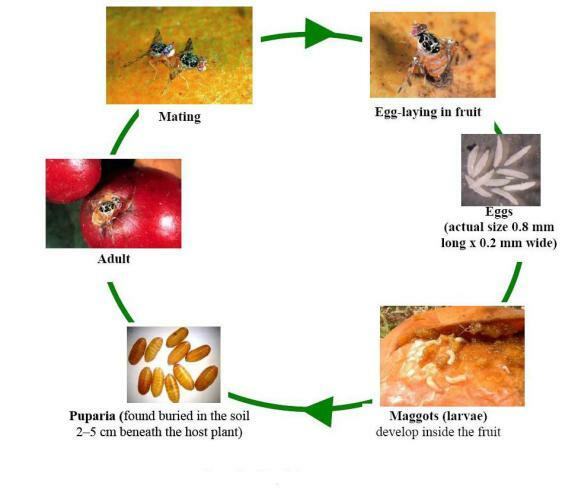 In fruits for export, fruit flies cause indirect losses resulting from quarantine restrictions that are imposed by importing countries to prevent entry of fruit flies. 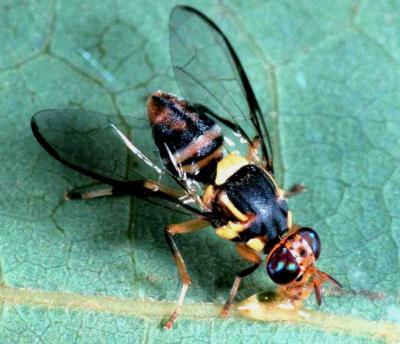 Nearly all fruit fly species are quarantine pests. Fruit flies attack soft, fleshy fruits of a wide variety of fruit and vegetable crops. 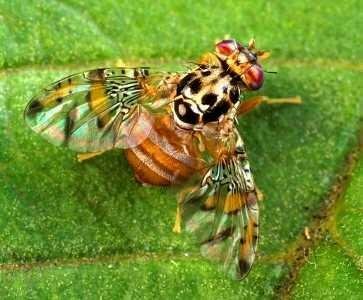 The Mediterranean fruit fly Ceratitis capitata feeds and causes damage to a very wide range of crops. Major host plants of Ceratitis cosyra include mango, guava, sour orange, marula, wild custard apple and wild apricot. Ceratitis rosa is recorded from over 100 plant species. In Africa it attacks mango, papaya, guava and custard apple. It is also a common pest of arabica coffee in eastern Africa. Ceratitis fasciventris is a major pest of mango, guava and coffee in eastern and western Africa. Bactrocera invadens, a new species recently introduced into East Africa, attacks primarily mango, although it has been reared from several other plants (e.g. tomato, banana, guava, marula, avocado). 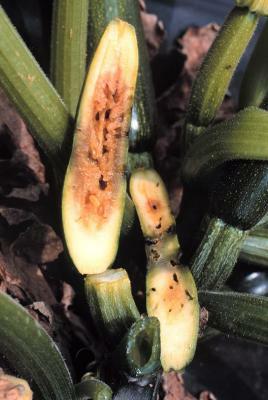 Bactrocera cucurbitae, Dacus bivitattus, D. ciliatus and D. frontalis are pests mainly of cucurbit crops. Damage symptoms vary from fruit to fruit. Attacked fruit usually shows punctures (made by females while laying eggs). Around these a necrosis may occur. Small holes on the fruits are visible when the maggot leaves the fruit. 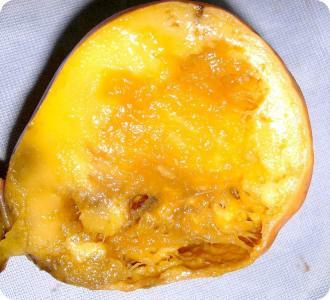 The affected part of the fruit becomes soft and colours prematurely. 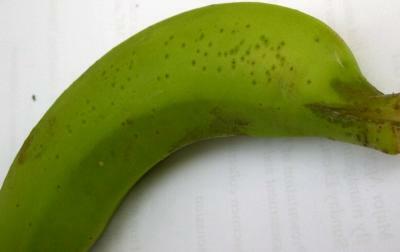 Fruits/pods: internal feeding; lesions; abnormal exudates; visible mould; discolouration; odour. The morphology of the various fruit fly species is similar. Eggs of fruits flies are small, white, and slender. They are laid under the skin of fruits in groups of 3 to 8 eggs, depending on the species. The flies lay eggs on mature green and ripening fruit. 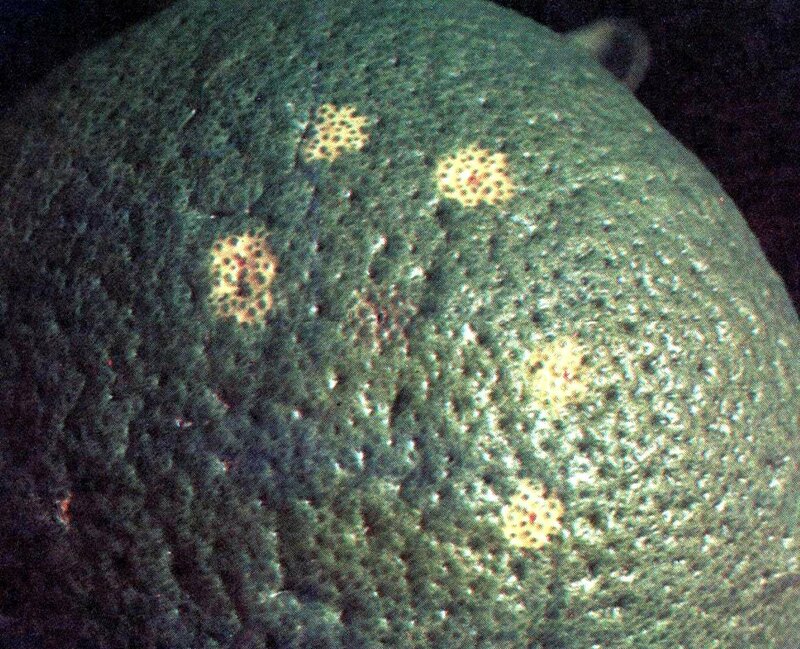 Some species may lay eggs in unripe fruitlets. Eggs hatch within 1 to 2 days. The larvae are whitish maggots. They feed on the fruit flesh causing the fruit to rot. 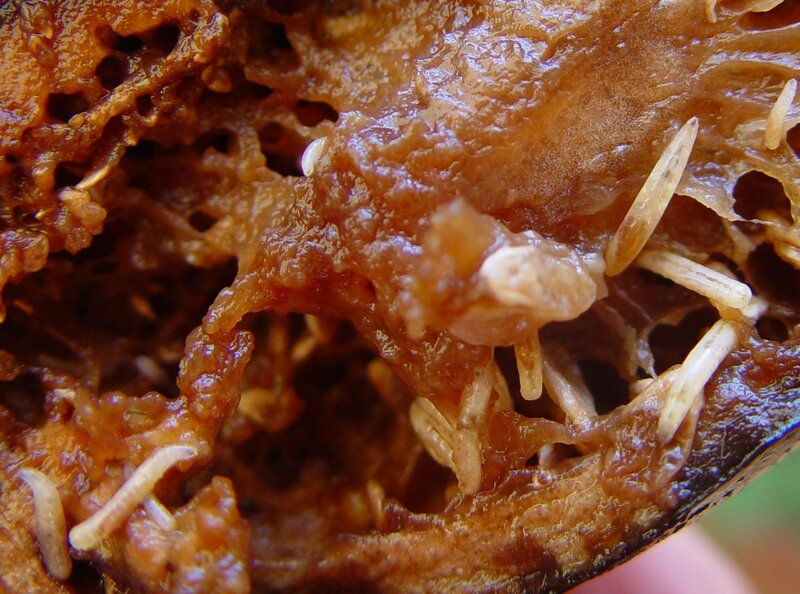 After 4 to 17 days the maggots leave the fruit, making holes in the skin, and drop to pupate in the soil. 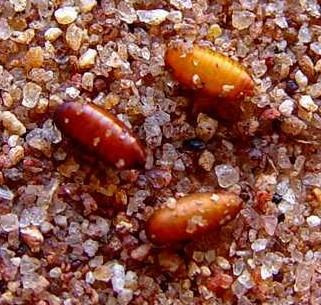 Pupa of the Mediterranean fruit fly (Ceratitis capitata) in the soil. The pupae are white, brown or black and 4 to 12 mm long. They are found in the soil 2 to 5 cm beneath the host plant. The flies emerge from the pupae 10 to 20 days after pupation depending on climatic conditions. Fruit Fly (Ceratitis fasciventris). Adult Ceratitis fasciventris are 4.5-6 mm long, brightly coloured, usually in brown-yellow patterns. The wings are spotted or banded with yellow and brown margins. Adult fruit flies are 4 to 7 mm long, brightly coloured, usually in brown-yellow patterns. The wings are spotted or banded with yellow and brown margins. Further below you find concrete preventive and curative methods against Fruit flies. Poorly managed or abandoned orchards can result in build up of fruit fly populations. Remove fruits with dimples and oozing clear sap. This method, although laborious, is more effective than picking rotten fruits from the ground, as the maggots may have left the fruits to pupate. To be effective this has to be done regularly (twice a week for the entire season). Kill the maggots by burning, burying or trying collected fruits in black plastic bags and exposing them to the heat of the sun for a few hours to kill the maggots. Alternatively, feed fruits to pigs or poultry. When burying fruits, ensure that the fruits are buried at least 50 cm (about two feet) deep to prevent emerging adult flies from reaching the soil surface. Destruction of fallen fruits infested by fruit flies by putting them in black plastic bags, tying the bags and exposing them to the sun. Harvesting crops early when mature green helps protect some crops from fruit fly damage. Fruit flies cannot develop in certain fruits such as papaya, banana and sapodilla when they are green. Only ripe fruits are good hosts. However, in other crops, such as mango this practice is not effective as some fruit fly species like Bactrocera invadens and Ceratitis cosyra are capable of infesting even immature or green mangoes. Several natural enemies can contribute to the suppression of fruit flies. Major natural enemies are parasitic wasps (parasites the maggots of fruit flies) and predators such as rove beetles, weaver ants, spiders and birds and bats. In particular weaver ants have been shown to be very efficient in protecting fruit trees from pests, including fruit flies. These ants pray on fruit flies, but most important their presence and foraging activity hinders the fruit flies from laying eggs, resulting in reduced fruit fly damage, as shown in mango orchards in Benin (Van Mele et al., 2007). Although natural enemies alone do not give satisfactory control of fruit flies, efforts should be made to protect them, and to complement their effect on fruit flies with other management options. Tiny wasps (e.g. Bracon spp.) parasitise the maggots of fruit flies. Eggs and larvae of these parasitoids are found inside the bodies of the maggots. The parasitoid larvae are tiny, cream-coloured grubs that feed in or on other insects. Adult wasps feed on nectar, honeydew or pollen before laying eggs. Dill, parsley, yarrow, zinnia, clover, alfalfa, parsley, cosmos, sunflower, and marigold are flowering crops that attract the native braconid populations and provide good habitats for them. The image shows a braconid wasp parasiting a caterpillar. 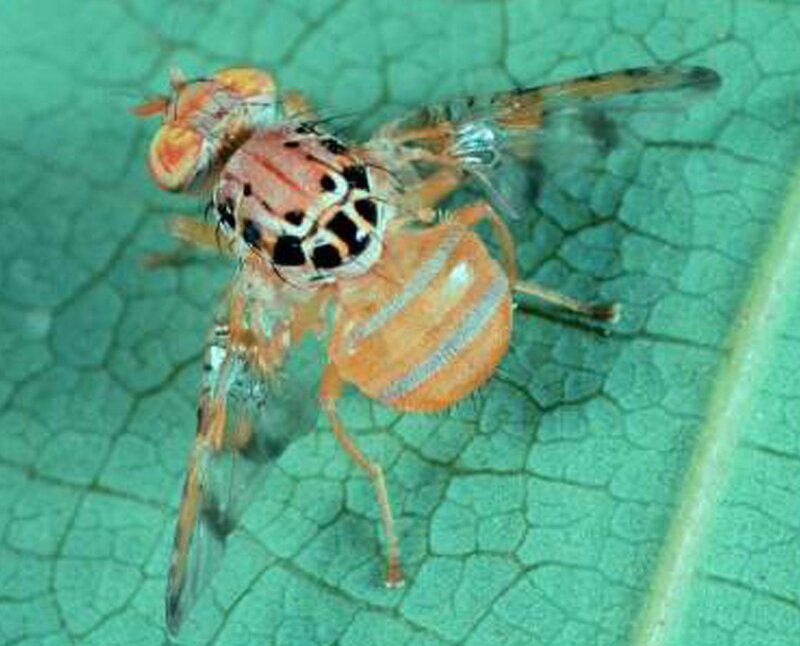 To control fruitflies, a spray with a pyrethrum solution can be used. It will kill bees if they are sprayed directly, but it does not leave poisonous residues. The best time to use it is in the evenings (after 6 pm) most of the bees are back in their hives. There is a product commercially available called Flower-DS(r) (available at the Hygrotech Company, contact-addresses below). This product is made of natural pyrethrum and is acceptable in organic certified systems. Artificial pyrethroids will work as well if you are not concerned about organic certification, but they are stronger and will leave residues on the fruits and leaves, which are poisonous to other animals, to useful insects and to humans. Precautions: Be careful to spray late in the evening. Follow the spraying instructions. Wear masks and skin protection. All insect poisons are also poisonous to humans even if coming from natural sources. Frequency of spraying: Start shortly after beginning of flowering, and repeat approx every 5 days or according to counts. Please check the insect trap information to count your fly population. If no flies are trapped - there is no need to spray. Frequent applications of neem can keep fruit fly attack to a minimum. The Lynfield trap is cheap and easy to make. It is made of a cylindrical plastic container with 4 holes evenly spaced on its sides, a lid, a wire hanger and a bait basket (if it is to be used with a dry attractant). 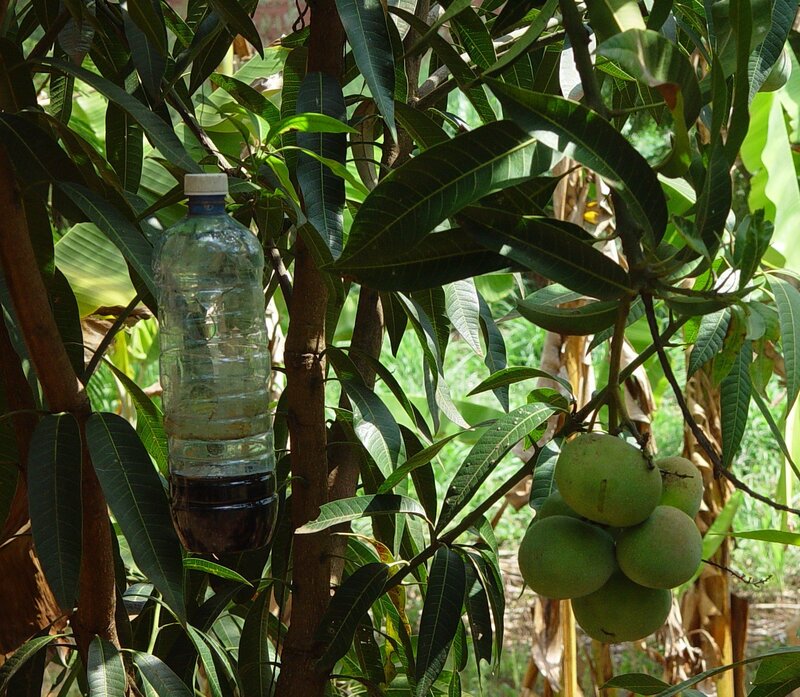 Similar traps can be made locally using 'Kimbo' or 'Blue Band' tubs or similar plastic containers or plastic bottles. They can be used with either specific attractants such as methyl eugenol or food baits such as protein hydrolysates or yeast or a peace of fruit (banana, mango). Also vinegar is a very good attractant. (Methyl eugenol attracts males of Bactrocera species and of a few Dacus species). Food baits attract both males and female fruit flies, they are not species specific, and also attract other insects, including natural enemies. Several types of commercial fruit fly baits exist but are not locally available or registered. Use food baits that attract a whole range of fruit fly species in the orchard such as protein hydrolysate (Nulure(r), Buminal(r), Solbait(r)). An alternative is waste brewers' yeast at a rate of 45 ml per litre water. Use about 250 ml of the mixture in each trap. 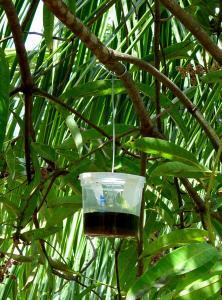 Add one tablespoonful of borax (di-sodium tetraborate) to each trap to prevent rotting of the flies caught. Hang the bottle in an area where you have seen most fruit flies. Depending on the amount of fruit flies you have, you can expect to start seeing the bottle fill up within just a few hours. The trap is filled with bait and hanged on the tree about 2 to 4 m above the ground within the canopy layer, in a semi-shaded spots, preferably in the upwind part of the canopy. The trap should be hanged in such a manner that branches and leaves are nearby, but not touching the trap. Traps should be hanged 10 to 50m apart, depending on the bait used. Collect catches weekly and sieve them. Bagging prevents fruit flies from laying eggs on the fruits. In addition, the bag provides physical protection from mechanical injuries (scars and scratches). Although laborious, it is cheap, safe, and gives a more reliable estimate of the projected harvest. Bagging not only protects fruit from fruit fly damage but protect the fruit from physical damage improving the market appearance of fruits. However, it is only practicable on small trees. Cut old newspapers measuring 15 x 22 cm or 12.5 x 27.5 cm for mango and for fruits of similar size. Double the layers, as single layers break apart easily. Fold and sew or staple the sides and bottom of the sheets to make a rectangular bag. Blow in the bag to inflate it. Remove some of the fruits, leaving one on each cluster. Insert one fruit per bag then close the bag using coconut midrib or firmly tie top end of bag with string or wire. Push the bottom of the bag upwards to prevent fruit from touching the bag. Use a ladder to reach as many fruits as possible. Secure the ladder firmly on the ground and for bigger and higher fruits trees, secure or tie the ladder firmly on big branches. 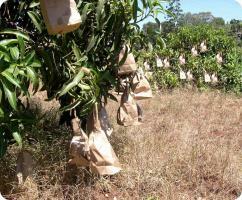 Mango fruit bagging in an orchard in Kenya to prevent infestation by fruit flies. Bagging works well with melon, bitter gourd, mango, guava, star fruit, and banana. Whole banana bunches may be bagged inside banana leaves. 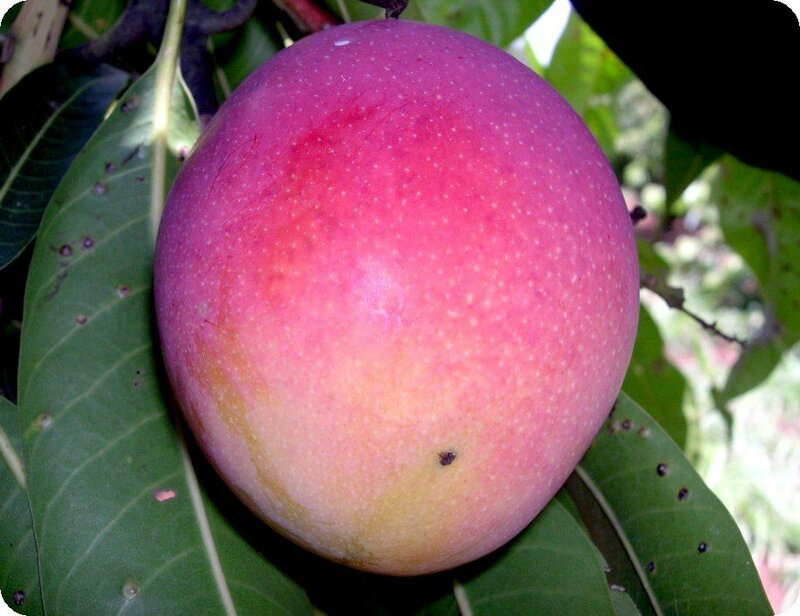 Start bagging the mango fruit 55 to 60 days from flower bloom or when the fruits are about the size of a chicken egg. When using plastic bags, open the bottom or cut a few small holes to allow moisture to dry up. Moisture trapped in the plastic bags damages and/or promotes fungal and bacterial growth that can cause diseases. Plastic also overheats the fruit. Bags made of dried plant leaves are good alternatives to plastic. 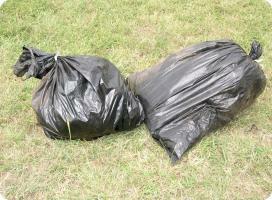 Remove the bags during harvest and dispose of them properly. ICIPE (2006). 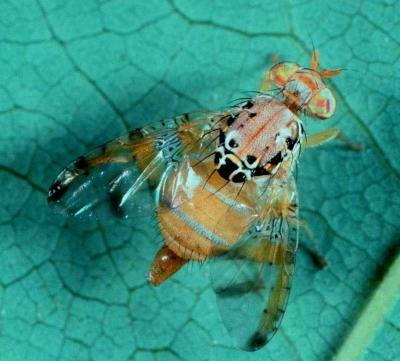 A Field Guide to the Management of Economically Important Tephritid Fruit Flies in Africa. S. Ekesi and M. K. Billah (editors). ISBN: 92-9064-179-7. Van Mele, P., Vayssieres, JF., Van Tellingen, E. and Vrolijks, J. (2007). Effects of an African Weaver Ant, Oeocphylla longinoda, in Controlling Mango Fruit Flies (Diptera: Tephritidae) in Benin. Journal of Economic Entomology. 100(3): 695-701. For information on small scale farming techniques, seeds, equipment and insecticides (e.g. pyrethrum solution).